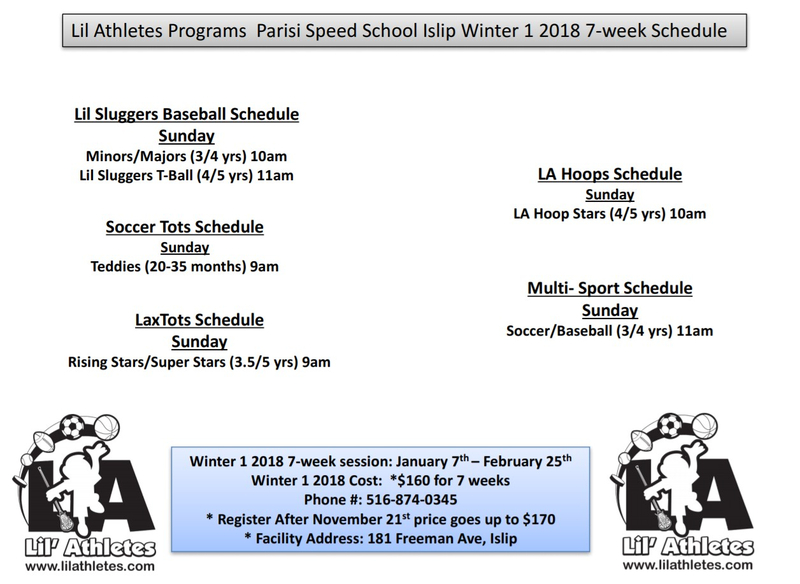 No equipment is needed for our classes with the exception of our 4/5 year old T-ball Classes and our LA KIDS Classes – . For t-ball children need a glove, helmet and bat are optional as we do provide them. LA KID children depends on the sport they participate in. Please email lilathletesinfo@gmail.com to find out more info. 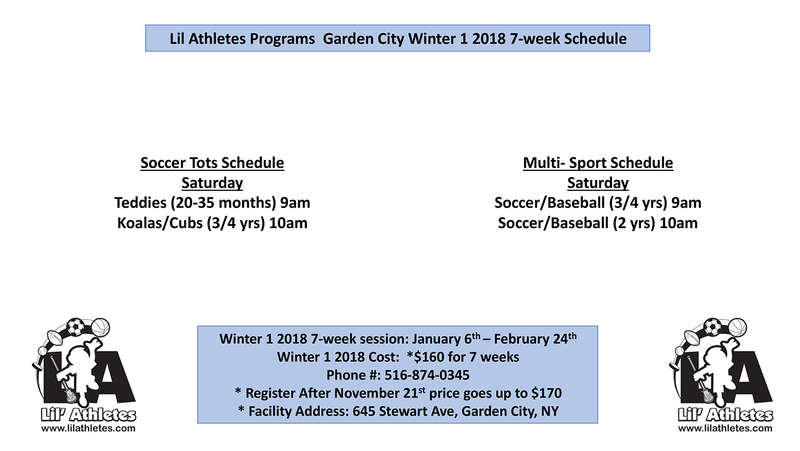 Participation is not required unless your child is enrolled in our SoccerTots Teddies I or II class and/or our Lil’ Sluggers Mascots 2 year old class. 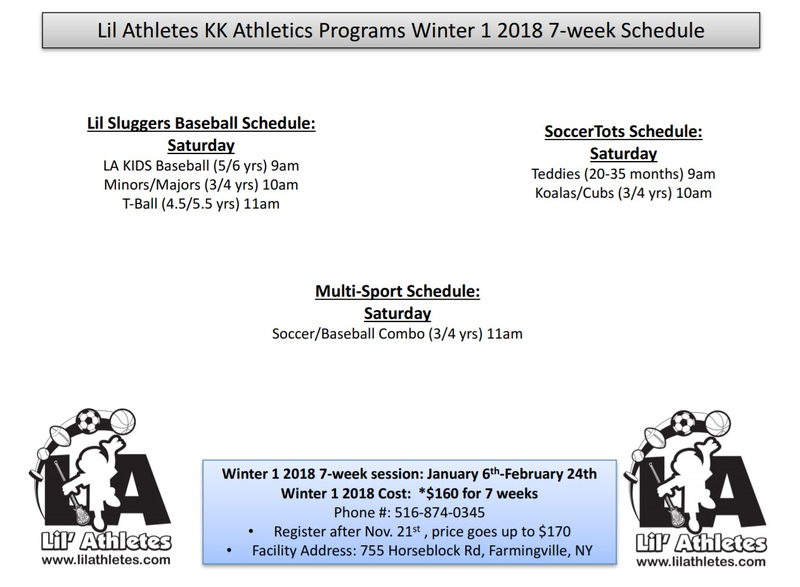 The only other time participation is required is for our 3 year old Lil’ Sluggers classes during batting. All other classes do not require parent participation. Each session we offer an Early Bird price which is typically a savings of $14-15. The Early Bird price typically runs for a month once the schedule is released. But please make sure to check our registration pages for the last day of early bird. 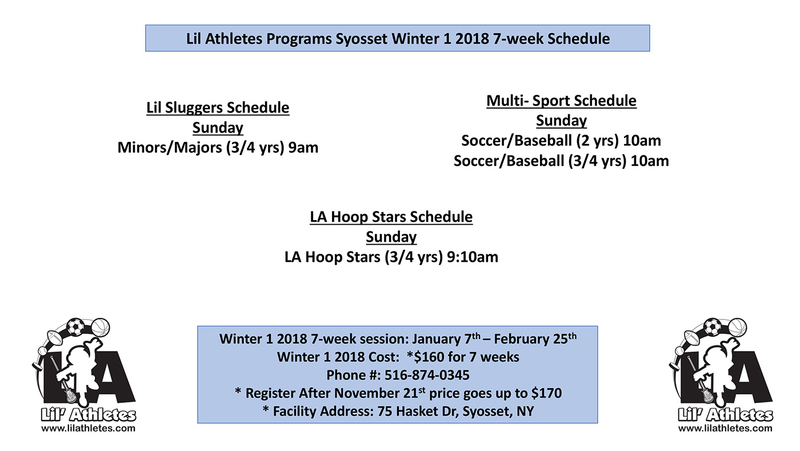 We also offer $30 multi-class discounts when your child is enrolled in more than one class in the same 7-week session (please us call to get this discount 516.874.0345). If you register for 3+ classes in the same session, the 3rd class and each subsequent class is $50 off. The final discount we offer is a 10% sibling discount. The first child is full price and each additional child within the same family is 10% off. How will I know if my child’s class is cancelled due to the weather? 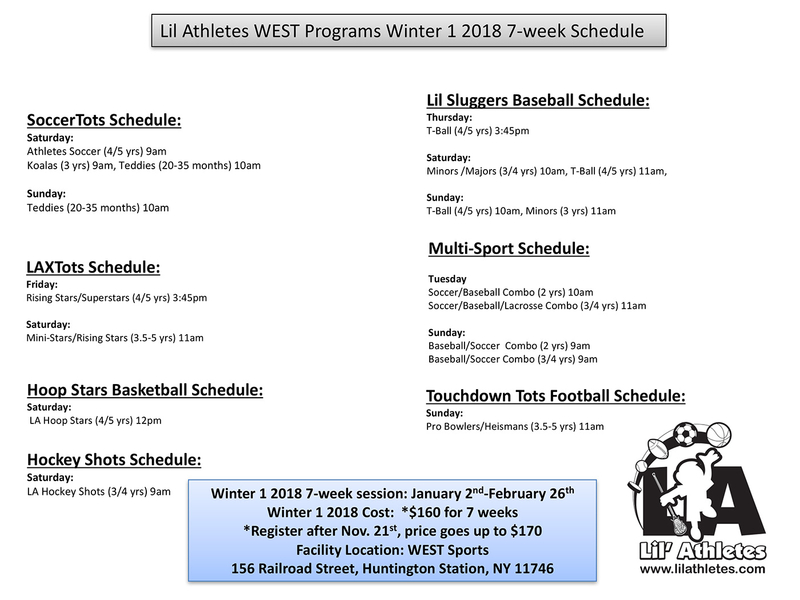 We post weather updates on our website in the red “NEWS” column www.lilathletes.com. We will also send an email to inform of class cancellations. Please make sure you have an updated email on file with us. Do you offer make up classes? We try out best to offer up to one make up class per session. Unfortunately because classes fill up and we cannot always predict which will be available for a make up, we cannot guarantee a make up class. Often times make ups do need to be held in a different sport or at a different location. 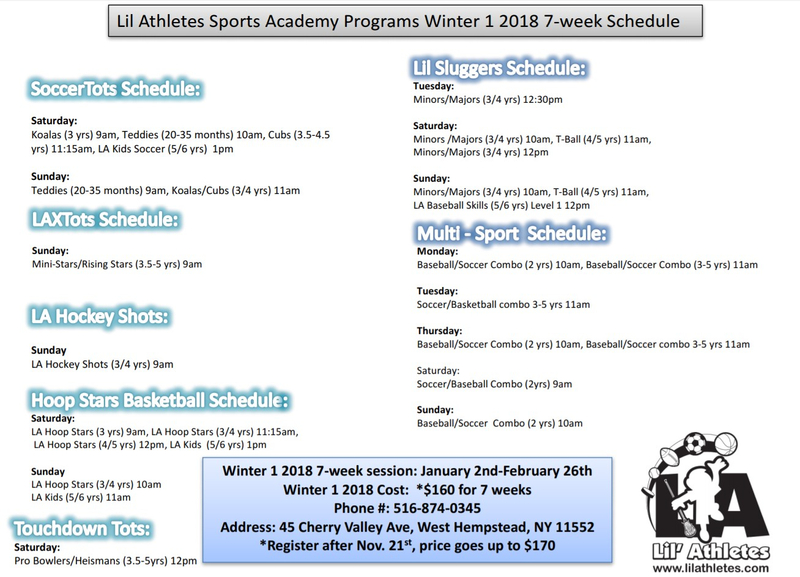 **Please email lilathletesinfo@gmail.com with information regarding the class your child will be missing as well as your availability for a make up class in order to schedule a make up. What happens if my child isn’t interested in the class after the first week? We really recommend that you give your child at least 3 classes to get comfortable with the class. Often times the first week is a completely new experience, by the second week children are a bit more familiar with the coach and the routine of the class. By the third week they should have had enough time to have adjusted to the coach, class and other children. If your child still is not interested in the class you can contact us for a class credit. We will prorate the credit for the number of classes left. Credits never expire, can be transferred and used toward any program at any location. We only issue refunds a week prior to the START date of the class and there is also a $10 processing fee for all refunds. We now have a calendar posted on our website. 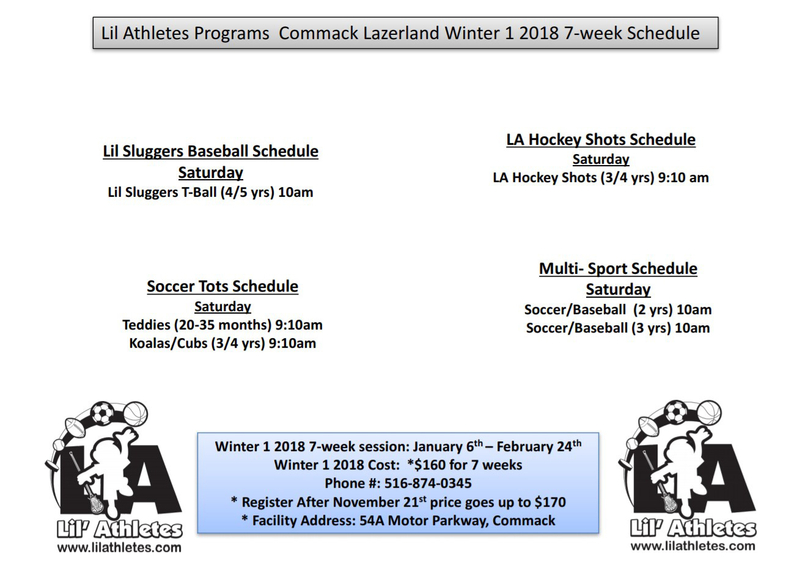 Please check out the program information pages to access the calendars. When is the schedule released for the next session? The schedule is typically released 2 months prior to the start date of the next session. 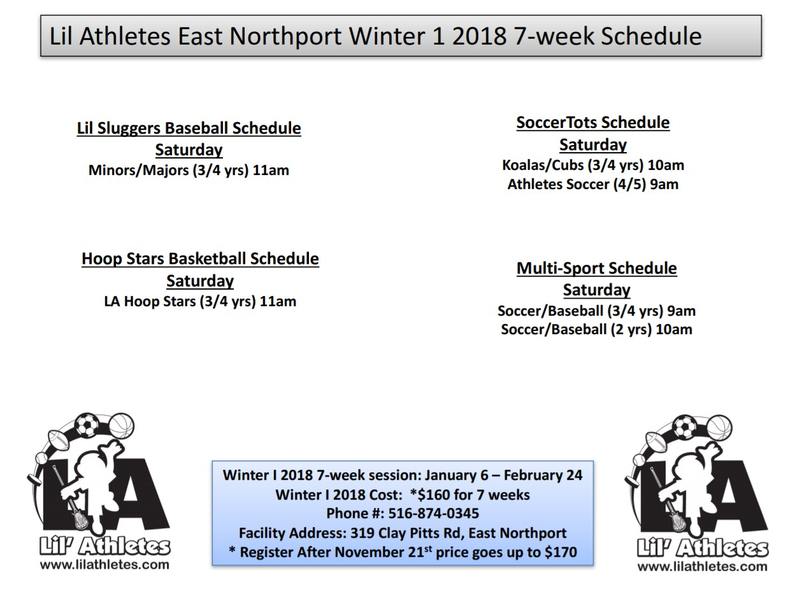 For example, Winter II begins in March so the class schedule will be released in January. Can I be automatically enrolled in the next session? Unfortunately we do not have an option for automatic enrollment. Registration is first-come-first-serve. 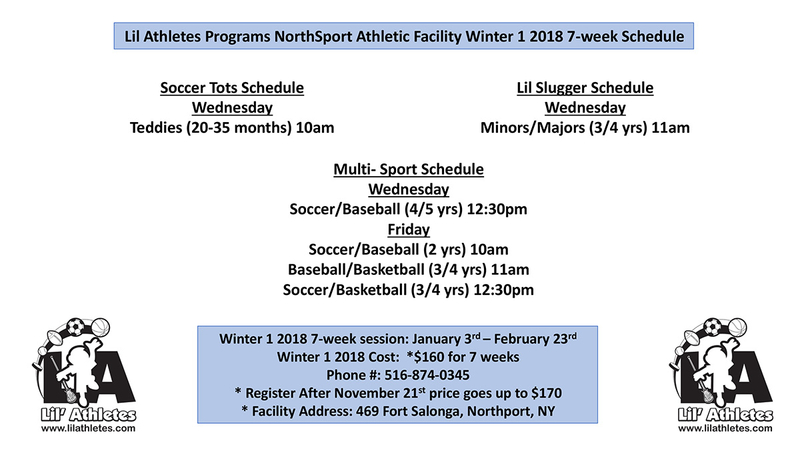 If you are looking to re-enroll we recommend registering by the 3rd or 4th week of the current session to ensure your child gets into the same class. Can I bring my other child(ren) to the class? We do allow other children to come to the class but they MUST remain on the sidelines. For safety reasons only children enrolled in the class will be able to participate or play on the field. I have twins or multiple children enrolled, do I need to have another adult with me? We do not require one adult per child but we do leave that up to you. Please just keep in mind if you have more than one child in a parent participation class you will have to help each child throughout the class. You are however more than welcome to have family and friends come to view the child’s class. Can I bring snacks and drinks to class? You are more than welcome to bring snacks and drinks but they are NOT allowed on the field. For safety reasons we ask that all food and drink be consumed in designated lobby areas. Please only have water on the sidelines for your child during class. We prefer your child to stay hydrated with water during class but we leave this up to the parents. Do you send an email to remind me that the session is about to begin? Unfortunately at this time our system only sends out an invoice when you register for the class. We are currently working on a way to give email updates and reminders. Please check the calendar on our website to insure you have the correct class dates. You may also call us at any time to confirm your child’s class 516.874.0345. Have a question you do not see? Fill out the form below and we will get right back to you!